BASILE, Pierpaolo ; et al. Overview of the EVALITA 2016 Named Entity rEcognition and Linking in Italian Tweets (NEEL-IT) Task In: EVALITA. Evaluation of NLP and Speech Tools for Italian: Proceedings of the Final Workshop 7 December 2016, Naples [online]. 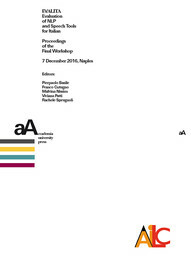 Torino: Accademia University Press, 2016 (generated 23 avril 2019). Available on the Internet: <http://books.openedition.org/aaccademia/1935>. ISBN: 9788899982553. DOI: 10.4000/books.aaccademia.1935. Basile, Pierpaolo, et al.. “Overview of the EVALITA 2016 Named Entity rEcognition and Linking in Italian Tweets (NEEL-IT) Task”. Basile, Pierpaolo, et al.. EVALITA. Evaluation of NLP and Speech Tools for Italian: Proceedings of the Final Workshop 7 December 2016, Naples. Torino: Accademia University Press, 2016. (pp. 40-47) Web. <http://books.openedition.org/aaccademia/1935>. BASILE, Pierpaolo (ed.) ; et al. EVALITA. Evaluation of NLP and Speech Tools for Italian: Proceedings of the Final Workshop 7 December 2016, Naples. New edition [online]. Torino: Accademia University Press, 2016 (generated 23 avril 2019). Available on the Internet: <http://books.openedition.org/aaccademia/1899>. ISBN: 9788899982553. DOI: 10.4000/books.aaccademia.1899.